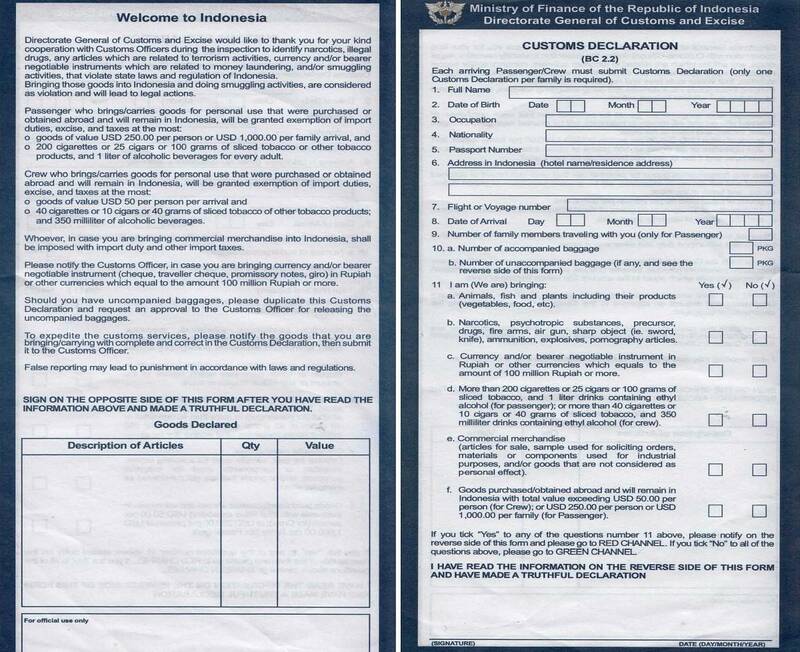 The Indonesian Government extends Visa on Arrival (VOA) to nationals of 61 countries which can be obtained at designated entry airports and sea ports. Visa-on-Arrival are valid for 30 days and are extendable with another 30 days to be applied at Immigration offices in Indonesia. Visas cost US$35. Please note that starting 26 January 2010, the 7-day Visa-on-Arrival was discontinued. 1. Algeria, 2. Australia, 3. Argentina, 4. Austria, 5. Bahrain, 6. Belgium, 7. Brazil, 8. Bulgaria, 19. Canada, 10.Cyprus, 11. Denmark, 12. Egypt, 13. Estonia, 14. Fiji, 15. Finland, 16. France,17. Germany, 18. Greece, 19. Hungary, 20. Iceland, 21. India, 22. Iran, 23. Ireland, 24. Italy, 25. Japan, 26. Kuwait, 27. Lao PDR, 28. Latvia, 29. Libya, 30. Lithuania, 31. Liechtenstein, 32. Luxemburg, 33. Malta, 34. Maldives, 35. Monaco, 36. Mexico, 37. New Zealand, 38. The Netherlands, 39. Norway, 40. Oman, 41. Panama, 42. The People’s Republic of China, 43.Poland, 44. Portugal, 45. Qatar, 46. Rumania, 47. Russia, 48.South Africa, 49.South Korea, 50. Switzerland, 51.Saudi Arabia, 52.Spain, 53. Suriname, 54. Sweden, 55. Slovakia, 56. Slovenia,57.Taiwan, 58. Tunisia. 59. The United Arab Emirates, 60. The United Kingdom, 61. The United States of America. Please make sure that you have one (1) entire blank page for the placement of your visa. If there is no page available, you run the risk of being turned away from Indonesia. 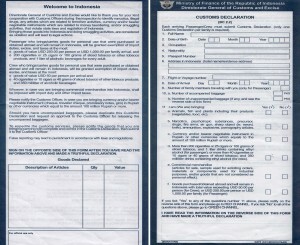 Please find a copy of the customs forms (it is only one page back and front) that you will be asked to fill out. Please fill them out on the plane (when the flight attendant passes them out) in order to facilitate your passing customs quickly. We have always found the customs officers quite friendly (no hassle types) so a quick smile goes along way. We are a leisure destination, so they are used to seeing a lot of camera equipment for all those divers that want to take underwater shots back home. Remember – NO DRUGS!